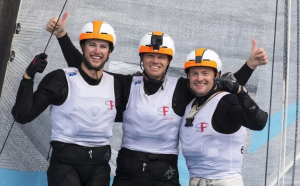 The SuperFoiler Grand Prix came to end this month in Sydney, in a dramatic finale, which saw team Euroflex take first place to lift the Ben Lexcen trophy. The Grand Prix series was comprised of five regattas across Australia, with six teams, each consisting of three high profile sailors from around the world. 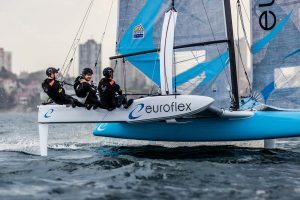 In the first three events, Euroflex took the competition by storm, taking gold in all three regattas and appearing to be on track to lift the trophy. This may have come as no surprise, seeing as the team contained one of the most elite sailing teams, comprised of America’s Cup winner, Glenn Ashby as well as Olympic Gold Medallists, Nathan Outteridge and Iain Jensen.However, after the leaders snapped their rudder stock in training just days before the Busselton regatta, tech2 went on to win the fourth event and close the gap at the top of the leaderboard to just two points. But when it came to the final, this time Euroflex made sure that they didn’t let their lead slip. The star-studded team took first place in 5 of the 9 Sydney races, securing their position as champions and lifting the Ben Lexcen trophy on Sunday. The Grand Prix lived up to its high expectations and Hall Spars were proud to be part of the development of the SuperFoiler class, one that is pushing the boundaries of technology, as one the fastest and most demanding foil-borne machine of its size on the planet. The boats were designed from the foils up, with Hall Spars building the masts, booms, rudders, elevators and hydrofoils for each one of them.